Armature assembly, Automobile parts - Jinn Woei - Tsay Co., Ltd.
Jinn Woei - Tsay Co., Ltd.
Jinn Woei - Tsay Co., Ltd. established since 1986 is a leading and professional manufacturer of armature assembly in Taiwan. Using specialized materials for production, Jinn Woei's line of armatures boast exceptional quality and precision. Even after long hours of usage and continuous operation, the products does not accumulate magnetism allows fast separation. Each cycle of operation only takes 0.02 second, and can still function normally under extreme high pressure. 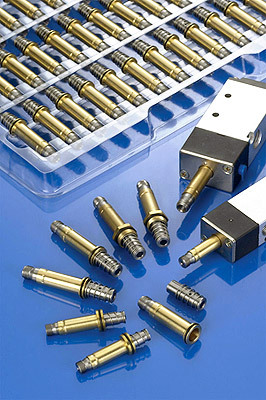 Armature assembly application: pneumatic solenoid valve, solenoid control valve, solenoid valve, sprinkler parts, diesel oil boiler parts, automobile parts...etc.